This work, completed years ago, in 2008, involves a great symbolism and expresses very well a big part of my inner world and my experiences, about things that are important to me. Technically this was the first illustration where I improved digital techniques. In this article you will find secrets of this work, sketches and images enhanced to better appreciate the details, as well as my motivations and why it is so special to me. It's a gray but beautiful day, in a stranger and very remote garden, in a long gone era. The garden is full of flowers and life, a wonderful place. Two lovely fairies, happily walking through the garden, the two fairies wore their best clothes and were impeccably combed... suddenly dark clouds arrive and it starts to rain, the wind blows stronger...the fairies, who are sisters, carry no umbrellas!, but large purple iris flowers, always friendly as all flowers are, are willing to help protecting precious fairy girls from rain. The garden is greener and greener, happy with the drops, the earth smells so good and small heart shaped leaves grateful the drops. Mr. Insect is carrying his own umbrella!! I found an old ambrotype. The glass is broken. It's very, very old. That was my first inspiration. I hold in my hand this little image, two precious sisters impeccably combed and dressed with ribbons in her hair. They shake their hands together and watch me trapped from the other side of the glass - sad. I want them out of there, give them wings and fresh dresses, and then take them to a beautiful place. I also felt trapped in my sadness I wanted to escape. In those days I was sad because I recently lost my father. I think that this fact influenced the melancholy that the rain transmits, perhaps they are my teradrops. I created a freedom garden for them, the garden where everything is live and flowers, beauty and friendship we all need to not feel so lonely. 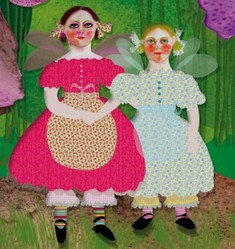 From a pencil sketch showing the faces of the fairies to the final result, there are several complex processes of superposed layers with different transparencies. I used many brushes with different shapes. The hair is the detail that brings more originality to the drawing, I paid special attention to the eyebrows and eye expression. Dresses are special, patterns are carefully chosen and buttons are full of realism. In fact, these are the details that bring personality to my illustration. The delicacy of the aprons and the colorful socks are also my favorite details. For creating the flowers I took one of my drawings with watercolors and pencils, and then I digitally transformed the leaves shape creating the effect that they are protecting the fairies. 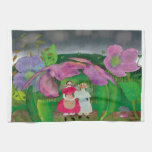 My Zazzle Collection of "Fairies in the garden"
In my Zazzle store "Gemma Roser Orte Inspiration", I created different products based on my illustrations. From the collection of "Fairies in the garden" you will find many product such as decorative pillows, iphone cases, necklaces and shopping bags; all of them are a very interesting selection of objects for both personal use and for decorating home. They are perfect for a special gift for everybody, children and adults. I also make custom projects. Nice work and collection. The overview of how you created 'the fairies in the garden' was also interesting. "Cooking with friends", an illustration for children and adults. 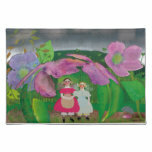 If you love birds and art, I recommend my illustration "Lovebirds in the forest". It's my work for this year 2013: Creation, significance, and techniques.